The eclectic Cash worked hard to avoid being pigeonholed, progressing from a rock-a-billy artist to a country hero, one that loved music too much to contain himself to one style. This lead Cash to record 1958's Hymns By Johnny Cash (reviewed in this issue), as well as numerous songs outside the country genre. One of the artists Cash recorded was Bob Dylan, a then hot young folk singer-songwriter that was unknown in country music circles, a circle that had yet to embrace Dylan's astonishing lyrics. That is until Cash, who knew genius when he heard it, stepped in and became the first country artist to cover Dylan. The covers - "It Ain't Me Babe" (backing vocals by June Carter), "Don't Think Twice, It's Alright", and "Mama, You've Been On My Mind" - found their way onto Orange Blossom Special, Cash's most eclectic album to date. From the country-folk remakes of Dylan's songs to the dark duet of Johnny Cash and June Carter (Cash's future wife) on Johnny Horton's "When It's Springtime In Alaska (It's Forty Below)". Through the ultimate protest song, "All of God's Children Ain't Free", Cash steps up to the plate and hits a home run, mixing originals with spicy covers, and forever shaking the ground of country music. The re-mastered re-release includes three bonus tracks that make this a must for country and Cash fans, as well as an added bonus for new fans. 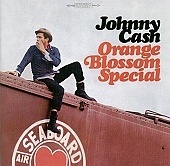 One of the bonus tracks included is an alternative version of Cash's remake on Dylan's "Mama, You've Been On My Mind". I'll give this an A+.